His loyal English Golden Retriever joined him on the rescue mission. 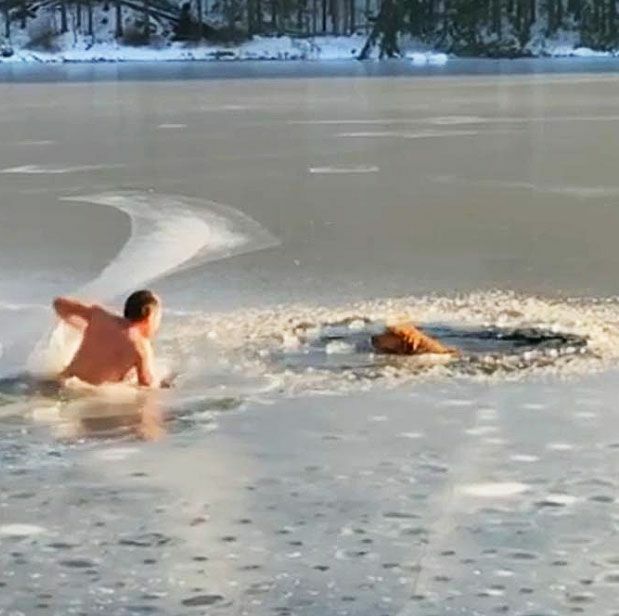 If you happen to need your faith in humanity restored, allow us to treat you to some footage of a man saving two dogs from drowning in a frozen reservoir. New Yorker Timofey Yuriev was walking his English Golden Retriever along the reservoir in Yonkers when he saw the two dogs, who had fallen through the ice. He immediately tore off his shirt, jumped into the ice-cold water, and swam to their aid. Yuriev made his way towards them, breaking a path through the ice so that they would be able to doggy-paddle with him back to safety. Yuriev prepared himself for the icy swim with deep breathing. "I used to live in Siberia,” he said, by way of explanation as to how he was able to dive into such cold water. “My grandfather, a hunter, he taught me how to stand cold, and how to prepare yourself." However, he advises that swimming in cold temperatures can be incredibly dangerous, and that wading into a frozen lake to help isn’t a decision to be made lightly: “If you’re not sure, ask somebody else, because you might cause more damage than good,” he said.